I bought this ultra-feminine pleated skirt back in May, and I'm just in love with it! I probably should have gotten around to styling it earlier, but better late than never right? :) Anyways, I love the trendy 'midi' length and the pale pink color! Those of you that have followed my blog for awhile...have you noticed that my style has gradually gotten more girly over the last year?? I'm not sure why that is, but I guess it's part of the evolution and maturation of one's style. Gorgeous! 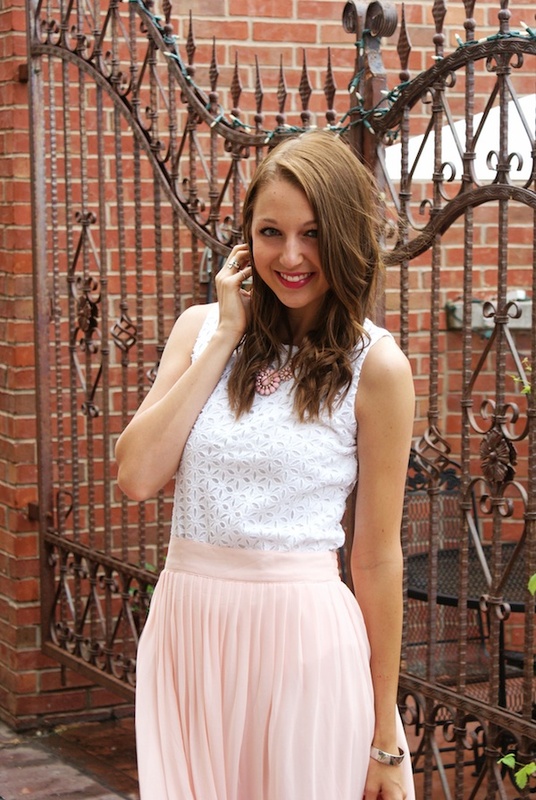 I love eyelet items for summer, and the matching necklace is perfect with the skirt! So pretty! I love how feminine and fresh your style is. The skirt is so light and pretty and the eyelet top is perfect with it. Love the heels as well! you look so sweet Jacy, love this outfit. This is such a pretty look , love that skirt . So girly. What a beautiful and feminine look. I absolutely love your skirt. Oh my goodness I love this skirt! And great styling with it! You look SO lovely! This dress is gorgeous! super cute look. i love those shoesss!! This look is lovely! The ankle strap heels go just perfectly. I'm loving this look is so pretty and feminine! So cute! That pink skirt is so so so stunning on you! You look stunning! I love the pale pink and the eyelet top just adds ups the pretty factor! Me encanta la falda!!! Tiene un diseño y un color maravilloso!!! Estás guapísima, Jacy! I love this top! I feel the same way about my style changing. It's been a fun journey :) you look great! So feminine and pretty! It reminds me of a ballerina! I am swooning over this charming girly outfit, this my type of style, really sweet and feminine. You look so beautiful Jacy, love the skirt. You always look gorgeous in this blush pink color. Love the skirt! It's such a soft, feminine look and I love everything about it! So coveting that skirt! Lovely lovely pink skirt & great heels to go with it! Lovely look Jacy! The pastel color is gorgeous! Wow beautiful look, Jacy! That skirt is stunning and I love it paired with the eyelet blouse - beautiful! Another beautifully coordinated outfit! I love love love this one with all my heart:)!! It's just so soft, feminine, flowy, and pretty! The eyelet with the pleats....such a stunning combo!